This November 2018 Thursday Nite Live celebrates 7 years of presenting the best live acoustic, jazz, fusion and roots music in Nairobi. 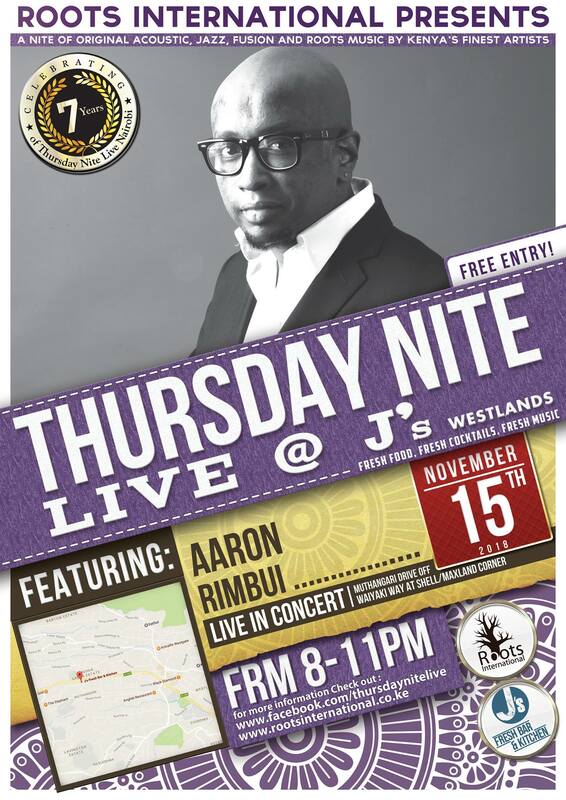 This week we welcome back to Nairobi jazz pianist Aaron Rimbui from his extended sojourn in New York City’s Jazz Scene. View his profile below. Aaron Rimbui is a jazz keyboardist, composer and performing artiste whose music is best described as colorful rhythmic melodies with African infusions served on a funky contemporary jazz platter. Aaron’s ear for music was spotted while still a toddler. Aaron started off his performance career in 2001 and has opened for leading artistes including Hugh Masekela, Kirk Franklin and Gerald Albright and worked as a band director with Tusker Project Fame. During this time he has performed with a host of artists including Emmanuel Jal, Lionel Loueke, Suzanne Owiyo, Eric Wainaina, Morris Mo Pleasure, Maurice Kirya, Moussa Diallo among many others. Together with Eric Wainaina, Aaron wrote and produced the theme song and music score for BBCs Tinga Tinga Tales which ran on the Disney Channel. Aaron has performed in Zimbabwe, Tanzania and Uganda as well as the United States of America He has 2 albums to date: the first Keys of Life released December 2005 and his second, Alfajiri released June 2009. In 2017/2018 Aaron Rimbui has been spreading his wings in the Jazz scene in New York City.